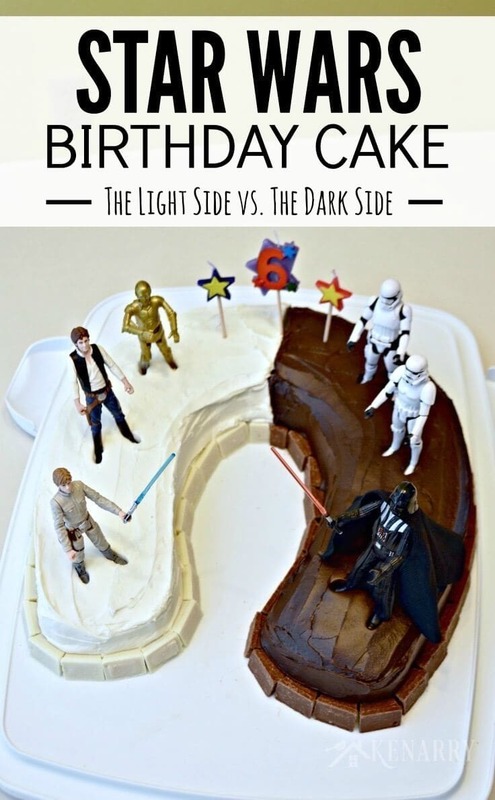 This easy idea for a Star Wars Birthday Cake has a dark side and a light side in an epic battle of the Force. We’re also sharing Star Wars party supplies. Does your child have a birthday coming up and practically lives and breathes Star Wars? 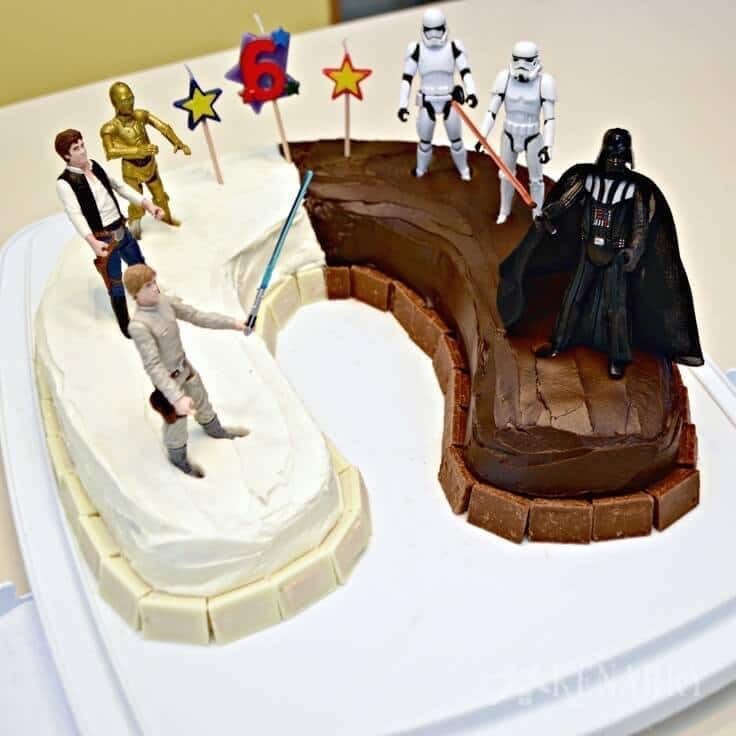 This easy idea for a Star Wars Birthday Cake has a dark side and a light side to show off the epic battle of The Force. 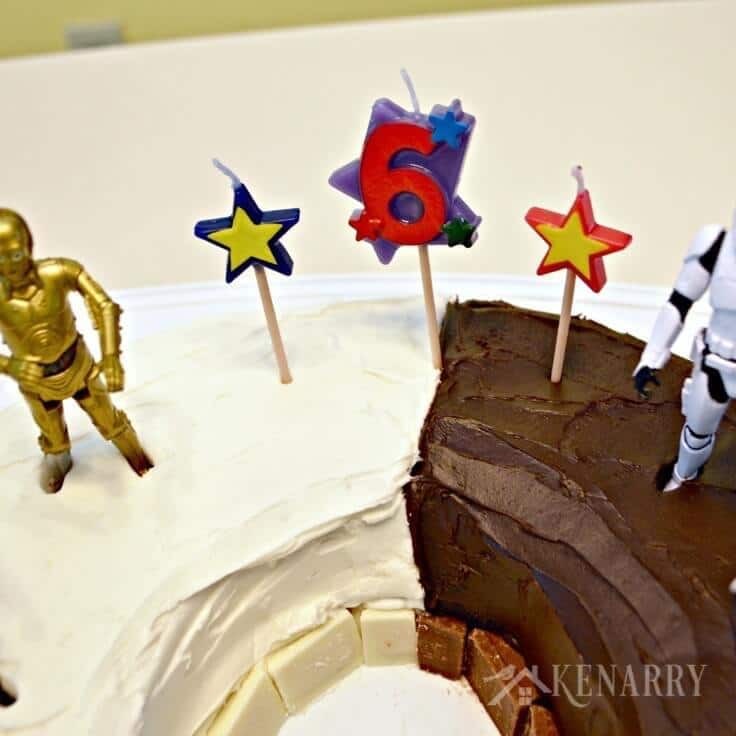 We’re also sharing Star Wars party supplies and other ideas to help you celebrate your child’s birthday. May the cake be with you! Our oldest son is a planner, like me. Even before he had an Angry Birds Cake for his fifth birthday, he was talking about how he was going to have a Star Wars birthday cake for his sixth birthday! This gave us an entire year to plan and prepare. 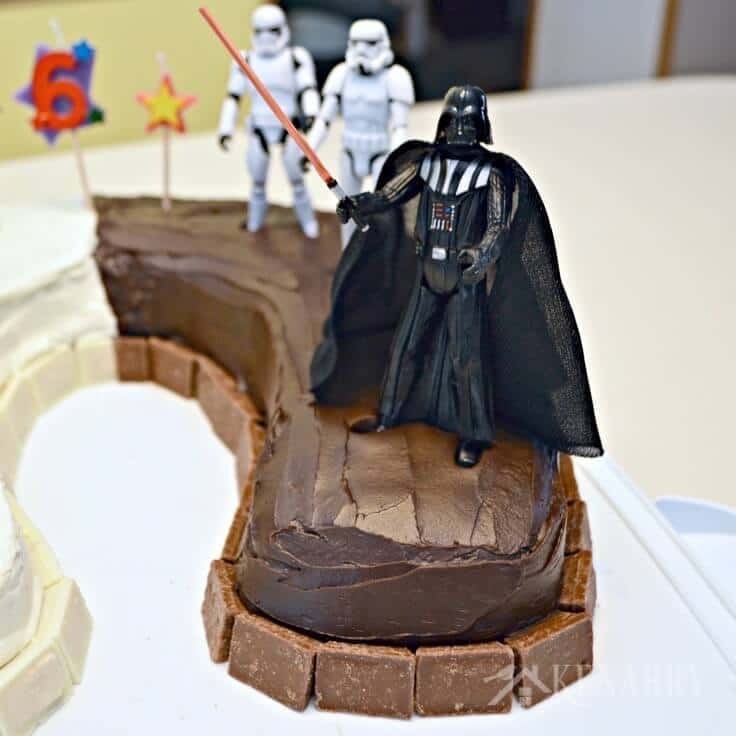 During that time frame, he watched all of the Star Wars movies with his father, we created Star Wars birthday treats to take to school, we found Star Wars party supplies and we brainstormed about a Star Wars birthday cake. If you’ve been following us for a while now here at Ideas for the Home by Kenarry™, you know I often like to use toys to decorate birthday cakes. I find it’s so much easier to think of the birthday cake as a back drop or stage. Then I use figurines or game pieces to set the stage and create a scene in the theme my kid chose for his birthday. While the Star Wars birthday cake brainstorming with my son initially included crazy ideas like a big spherical cake decorated like the Death Star, we eventually agreed it would be MUCH simpler to just use Star Wars figurines instead. To take things up a notch though we decided to use a horseshoe or U-shaped cake pan and make half of it white for the “light side” of The Force and the other half chocolate for the “dark side.” As you’ll see in our easy Star Wars birthday cake tutorial below, we didn’t just limit ourselves to light and dark frosting — the actual cake itself is light and dark too! Who knew turning six was such a big deal?! Making a Star Wars birthday cake is incredibly easy. You just need a few cake mixes, some frosting, candy and action figures of your child’s (or spouse’s!) favorite Star Wars characters. 1. Prepare the cake mixes. In separate bowls, prepare the dark chocolate and white cake mixes per the directions on the package. 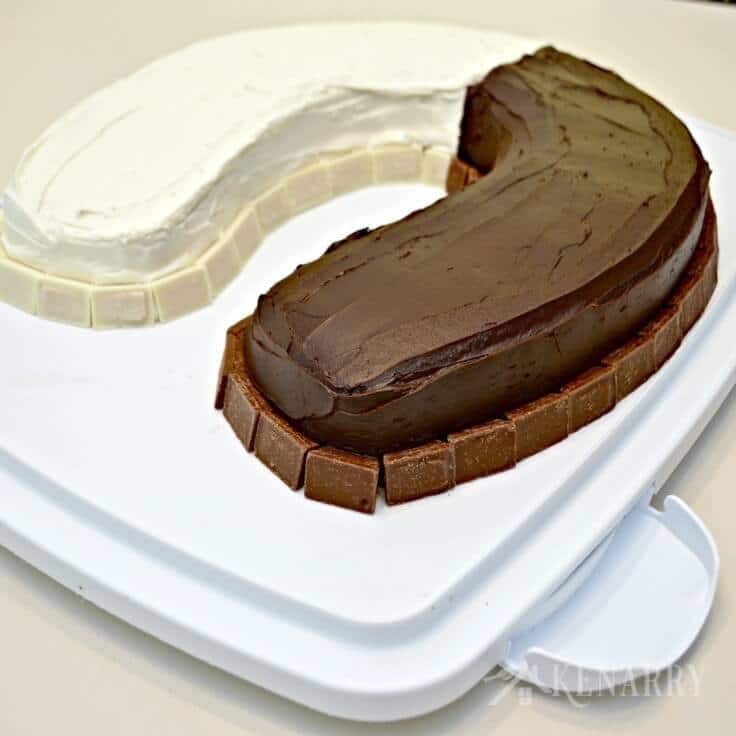 Next spray the horseshoe or U-shaped cake pan lightly with cooking spray. 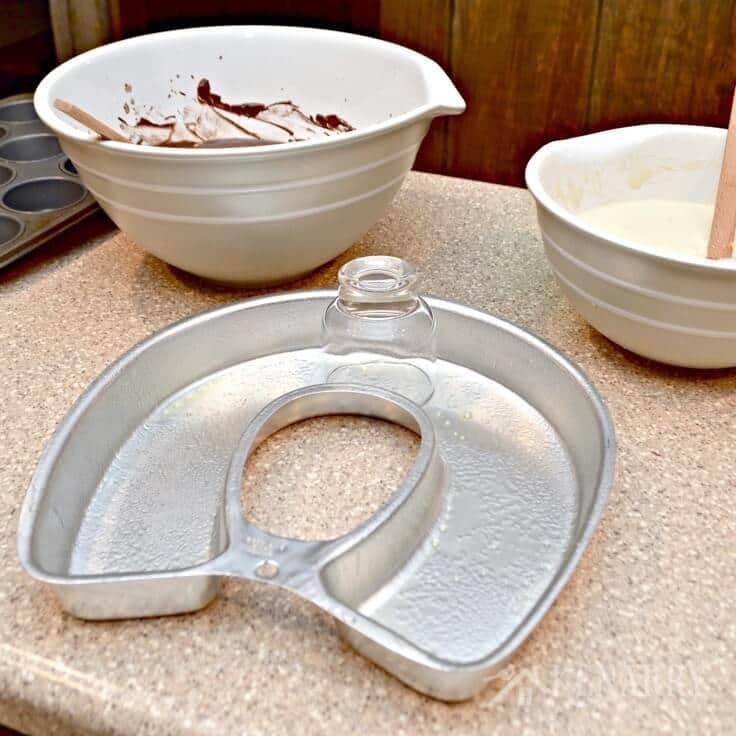 Place a drinking glass or cylindrical vase upside down at the base of the U. You’re going to use this to physically separate the two cake mixes when you pour them into the pan. 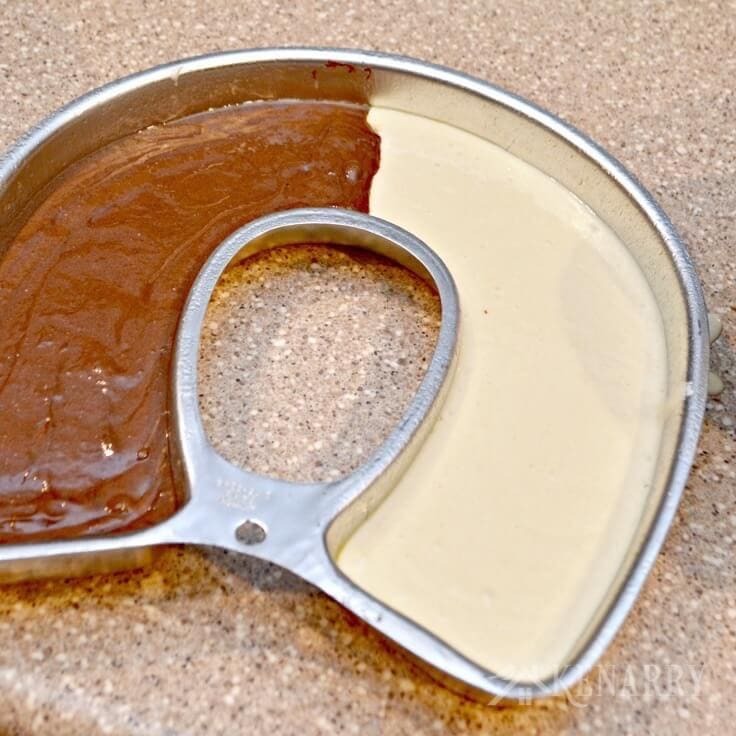 Pour the two cake mixes into the horseshoe or U-shaped cake pan on either side of the drinking glass. I poured just a little at a time and worked my way up, so that one cake mix didn’t spread over to the “other” side. DO NOT pour the entire cake mixes into the pan or you will overflow your cake when it bakes. 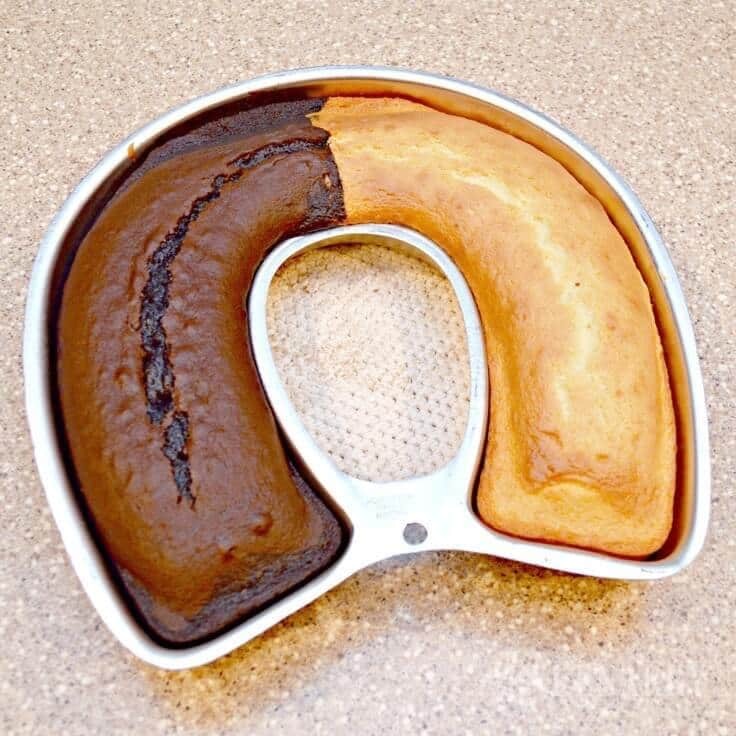 Stop pouring once the cake mixes fill about 2/3 of the horseshoe or U-shaped cake pan. 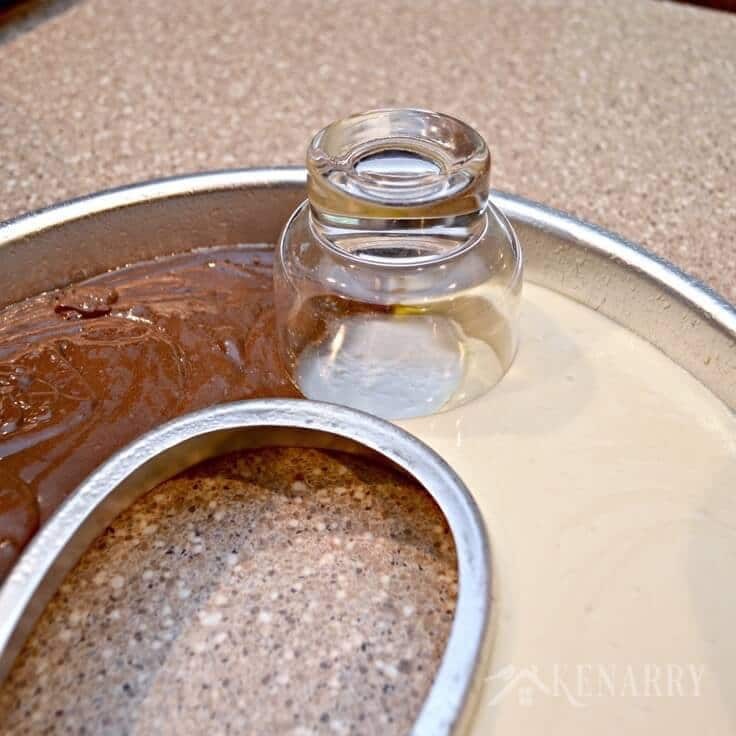 Next, carefully and quickly remove the drinking glass or vase from the base of the U. You should have a pretty well-defined line between the dark chocolate and white cake mixes. 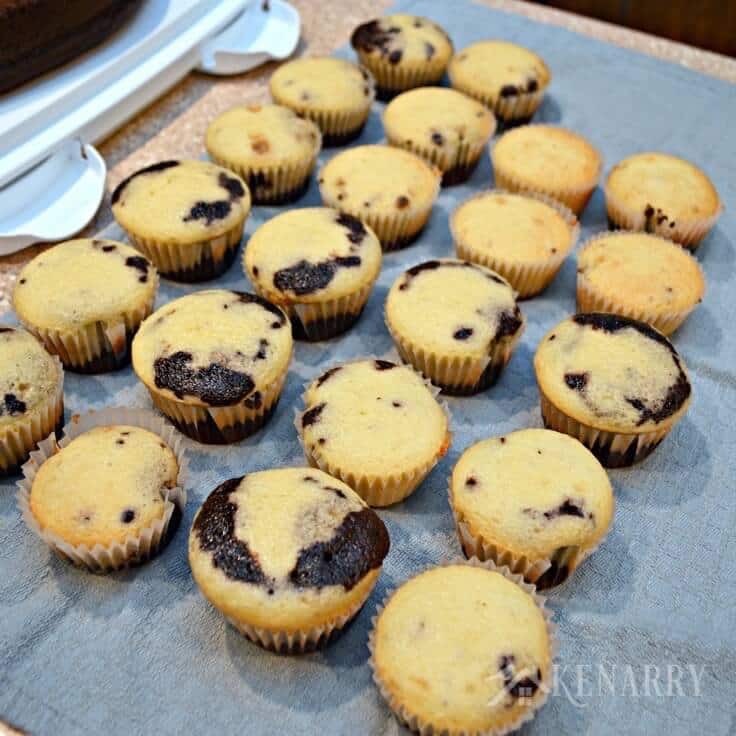 If necessary, you can center the line a little by placing a spatula in either the dark or light side and gently pushing the batter toward the center. Pour the remaining batter into cupcake tins. Why let it go to waste, right? You can see I used a little of each cake mix to give our cupcakes a marbled effect. We didn’t need extra cupcakes to feed party guests, so I froze the cupcakes as is once they cooled. For a few months after the birthday party, whenever we wanted to enjoy a little sweet treat, I just thawed a few cupcakes and frosted them on an as needed basis. 2. 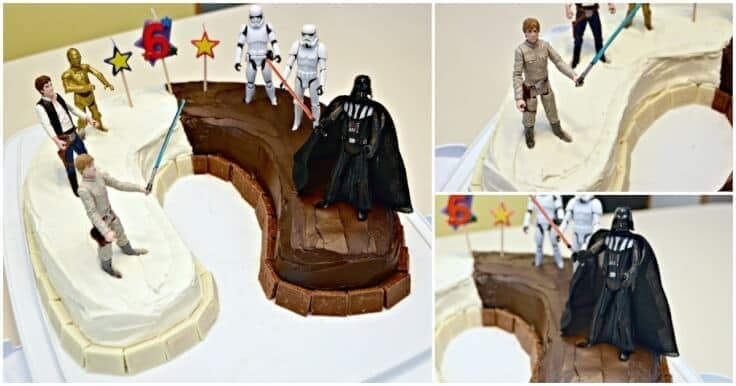 Bake the Star Wars birthday cake. Follow the directions on the cake mix box and use the time and temperature like you’re making a bundt cake. Watch it closely toward the end of the time. 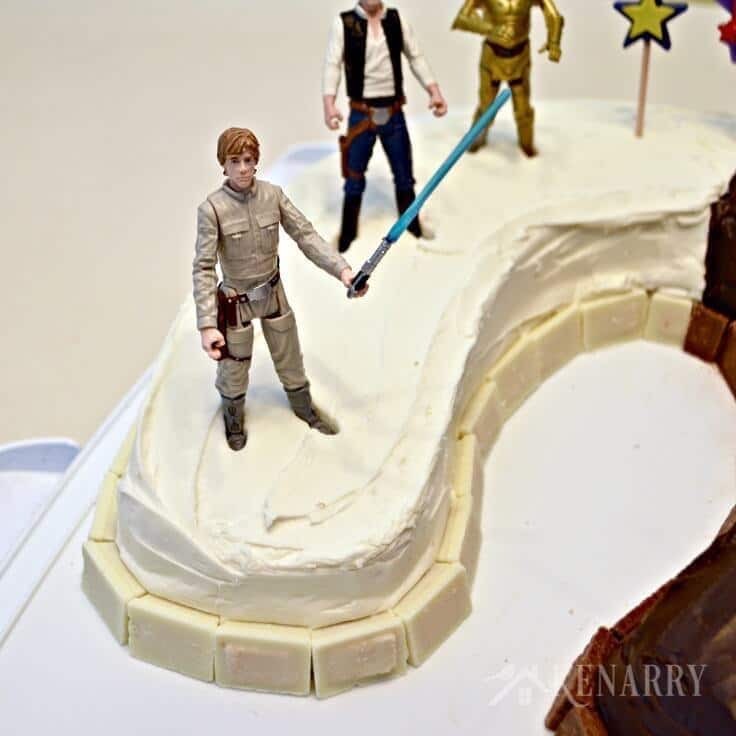 Bake the Star Wars birthday cake until a toothpick comes out clean. with a lid so we could easily store the leftover cake later once we’d celebrated C1’s birthday and removed the Star Wars figurines. This probably goes without saying, but next you’ll frost the white side of the cake with white frosting and the dark side of the cake with dark chocolate. 4. 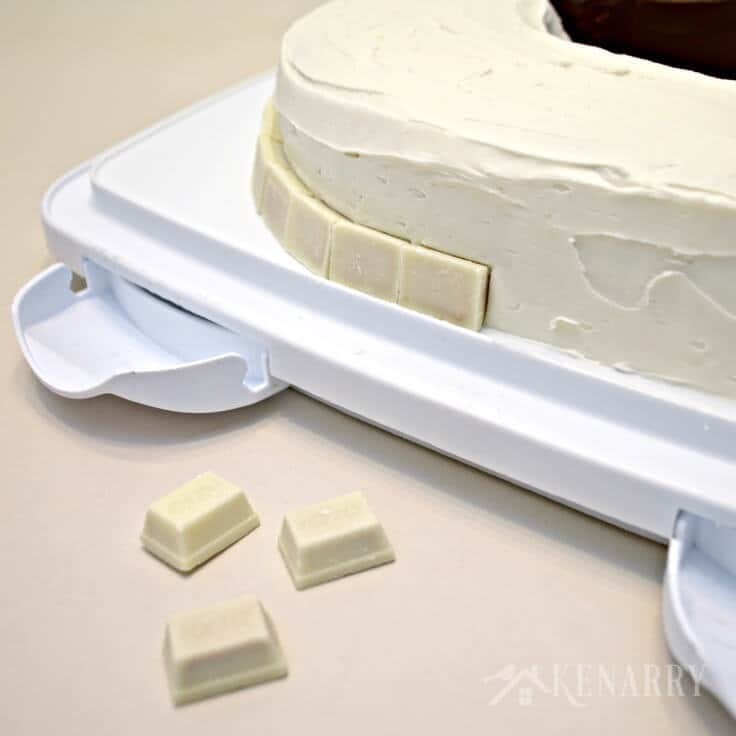 Place candy around the Star Wars birthday cake. I thought about using a cake decorating bag and tip to frost a border around the bottom edge of the cake. It then occurred to me using smooth pieces of candy might give the border a more futuristic appearance. I ended up using Mini Kit Kats and pushing them sideways into the cake so the bottoms showed. I love how the Kit Kats looked around the cake. It looks like a stage ready for battle, doesn’t it? 5. Position the Star Wars figurines. Next place the Star Wars action figures where you want them on the birthday cake to create a scene. Of course, Luke Skywalker, Han Solo and C3PO go on the light side. We would have used Chewbacca too, but for some reason he was missing a head when we found him in the playroom! BOYS! Darth Vader and his cronies the Storm Troopers go on the dark side. Ours had a cloth cape so we tried really hard to make sure it didn’t land in the frosting. When we served the cake, everyone insisted they needed a little sliver from both the light side and the dark side of the cake. I can’t say that I blame them! After the birthday party, we figured out all of the characters had small holes in the bottom of their feet. We had to use toothpicks to clean out the frosting. If we were to do it again, I’d put a little clear tape on the bottom of each one to prevent that from happening. After we wiped the Star Wars figurines with a little soap and water they were as good as new and ready to play again another day. Oh fun! How did you make a cake into a storm trooper? I might need to know for my son’s 7th birthday. 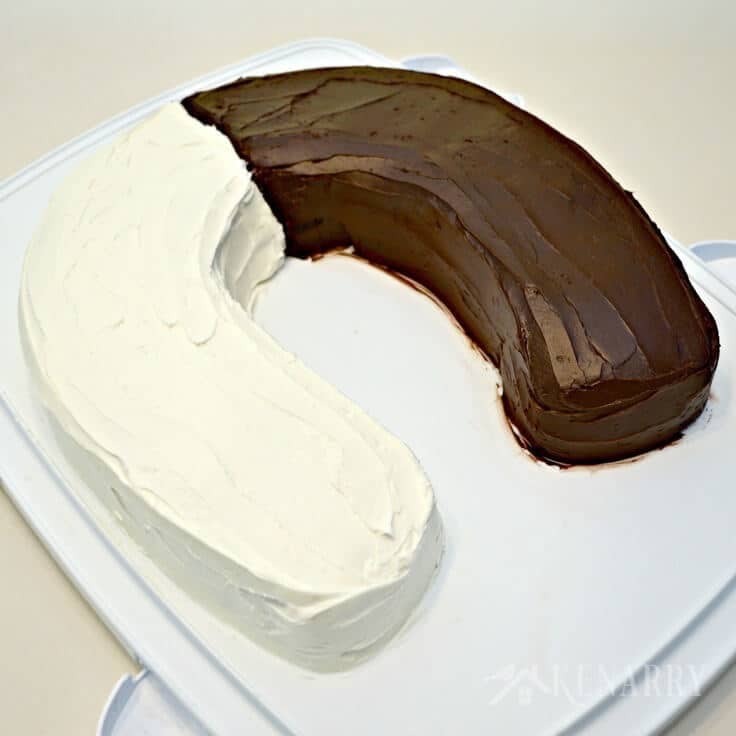 what a great concept for a cake! looks good! Thank you so much, Akaleistar!